(June 10, 2011) Long time Merrick resident Dan Hyman was elected president of the Nassau Hiking and Outdoor Club (NHOC) by an overwhelming majority of club members present at the their May meeting. Dan had been acting president since May 2010 when he was appointed to complete the term of the former president who had to step down. The recent election will allow him to continue as president for the next 2 years. Dan has been an active NHOC member for 10 years. Prior to assuming the role of president, he served as the club's weekend trip coordinator. He also regularly leads hikes and will continue to do so during his presidency. When asked to comment on his plans for the club over the next few years, Dan responded by saying "our members are really happy with the wide array of activities we currently offer and I'll work hard to maintain that." Nassau Hiking and Outdoor Club (NHOC) has over 400 members from all over Long Island who share a common appreciation for the outdoors. Club activities include hiking, nature walks, kayaking, camping, weekend trips and much more. Club volunteers maintain trails in public parks in Suffolk and Rockland Counties and the club's Conservation Chairman keeps members informed about environmental issues with regular articles in the club's official newsletter, Shorelines. The club holds meetings about 6 times a year at the Special Events Center at Eisenhower Park in East Meadow. Visit the club online at www.nassauhiking.org. (October 26, 2010) On Tuesday October 19th, the North Massapequa based wild life rescue organization, Wildlife in Need of Rescue and Rehabilitation, presented an educational program to the Nassau Hiking and Outdoor Club (NHOC). 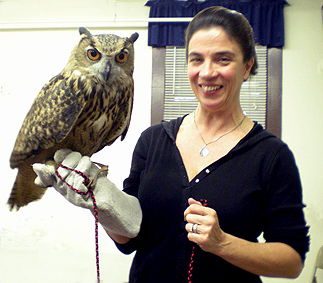 The program, which included a close up viewing of several rescued owls and hawks, was led by the rescue group's founding members, Cathy and Bobby Horvath. This husband and wife team of life-long wildlife enthusiasts earned DEC animal rescue licenses 18 years ago and founded their organization in 2002. Over the years, they have rescued countless animals—from tiny baby owls to bald eagles and even deer. Many disabled animals that cannot be released into the wild have found a permanent home with Cathy and Bobby. "These small educational programs are one way we can build public awareness about animals in need and raise some much needed funds for the animals in our care" said Cathy Horvath. The Nassau Hiking and Outdoor Club hosts 4 or 5 educational programs each year. These programs cover a wide variety of topics relating to the outdoors. The programs are free of charge and open to the public. Nassau Hiking and Outdoor Club (NHOC) has over 400 members from all over Long Island who share a common appreciation for the outdoors. Club activities include hiking, nature walks, kayaking, camping, weekend trips and much more. Club volunteers maintain trails in public parks in Suffolk and Rockland Counties and the club's Conservation Chairman keeps members informed about environmental issues with regular articles in the club's official newsletter, Shorelines. The club holds meetings about 6 times a year at the Special Events Center at Eisenhower Park in East Meadow. Visit the club on the internet at www.nassauhiking.org. (November 12, 2009) The Nassau Hiking and Outdoor Club (NHOC), which meets regularly at the Eisenhower Park Special Events Center and frequently hosts hikes through the park, has just concluded its 36th annual Thanksgiving on the Trail celebration. On Saturday November 7, 2009 the club headed to Pelton Pond in Fahnestock State Park, Putnum County. Over 80 club members and guests were in attendance. The festivities began at 10am with club members hitting the trails. While long time club member Don Phillips led the more experienced hikers on a challenging 8 mile hike, club members Dan Hyman and Jill Klasson, led other hikers on the more gentle trails. All of the hikes provided a picturesque view of the pond as well as the changing leaves. By 1pm everyone headed back to the sheltered picnic area where a Thanksgiving feast was served with all the trimmings. Turkey and ham was heated up in the large fireplaces in the picnic area and, in keeping with club tradition, each attendee brought a side dish. Traditional dishes like cranberry sauce, stuffing and corn were served side-by-side with less traditional fare like macaroni and cheese. Even desert was served. 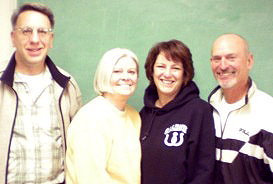 Long time club member Gail Robertson has been the event coordinator for the past 4 years. "In 2005 I was unable to hike. I stayed behind to assist with the cooking and I was hooked," said Gail. "I've been the event coordinator ever since." Gail estimates that, beginning in September, she spends several hours each week planning the event. Since Fahnestock Park requires visitors to remove their trash, Gail even has to coordinate trash removal! This event is one of the NHOC's most popular activities and Gail anticipates that "it will continue to be an annual tradition for many years to come." Plans are already underway for next year's celebration. (October 27, 2009) The Nassau Hiking and Outdoor Club (NHOC), which meets regularly at the Eisenhower Park Special Events Center and frequently hosts hikes through the park, has just returned from their annual weekend trip to Montauk. From Friday October 23, 2009 to Sunday October 25, 2009 the NHOC club members stayed at the beautiful Ocean Beach Resort. Hikes included a 4-5 mile hike around Big Reed Pond, Quadam's Hill and Oyster Pond; a 6-7 mile hike from Camp Hero to the lighthouse and back, a 5-6 mile hike around Fresh Pond and a 1 mile hike in the Famous Walking Dunes. The hikes were led by two long-time club members and experienced hikers Dennis Chemick and Quyen Pham. "This weekend trip gave members the opportunity to not only hike on some of the East End's most beautiful trails, but to socialize with other club members in Montauk's rich array of restaurants," said Dennis Chemick, who also serves on the NHOC Board as Membership Chairman. This was the 2nd annual Montauk trip organized by the NHOC and is one of their most popular events. Over 80 club members and guests attended. Plans are already being made for the 2010 Montauk event.